La La Land Tour is a one day driving tour, taking you past various filming locations for the highly acclaimed musical, La La Land. In the film, two young performers (Emma Stone, Ryan Gosling) work to advance their careers and romance throughout the course of a year in Los Angeles. 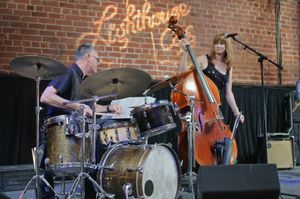 Their blossoming relationship takes them on a musical journey to several wonderful Southern California locales. 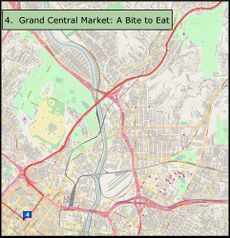 All the shooting locations are centered, however, in a close proximity to Los Angeles. The tour is 50 miles (80 km) long and includes seven filming locations. It would take about two hours without stopping at the sights, but to properly do the tour, you'll want to make stops for photos, food, and general looking around. It's wise to plan for a full day. We recommend you to embark on the tour during the weekend so that you can avoid rush hour traffic. Bring your car as shooting locations are spread out around Los Angeles and you won't be able to walk between them. Also, some of the places are only reachable by car. This is the spot where Mia and Sebastian have their romantic dance number, and if you’re willing to park on a hill, take a small hike up to the top-- ‘O the sights you'll see. 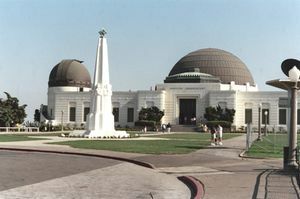 The Griffith Observatory is a popular morning hike/field trip/date night location, where spectators can peer through telescopes to explore far away galaxies. As you saunter through, you can enjoy an inexpensive planetarium show or play with the interactive exhibits, built for adults and children alike. The unobstructed panoramic view is absolutely priceless. Visitors can see everything from actual planets to the Hollywood sign, downtown Los Angeles, and even the ocean-- on a clear sunny afternoon. This majestic concrete bridge located in Pasadena, California is also known as the ‘Arroyo Seco Bridge’, seeing as it is located over the Arroyo Seco Canyon that links the San Gabriel Mountains to the Los Angeles River. This bridge was a part of the historic Route 66 until 1940 when the Arroyo Seco Parkway opened. Today this bridge is listed as a part of the National Register of Historic Places. This bridge features lovely details-- like its ornate, vintage lights, elegant arches, and a few benches. It overlooks a freeway overpass-- making it a cool spot for the view. Colorado Street Bridge is an awesome place for that perfect Instagram photo, dance flash mob, or evening time proposal. Because of its length it is also good for that brisk morning walk, or evening jog. 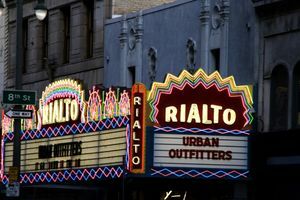 (810 S Broadway, Los Angeles, CA 90014) One of the first theatres to have stadium style seating with no balcony, the Rialto Theatre first opened its doors to moviegoers in 1917. Their first movie screening was of the silent film, The Garden of Allah on May 21, 1971. Known as one of the last single-screen theatres in California, this theatre has recently served its community as an Urban Outfitters. Although the theater itself has now closed (the interior shots used a different auditorium), its famous marquee is still prominently displayed. 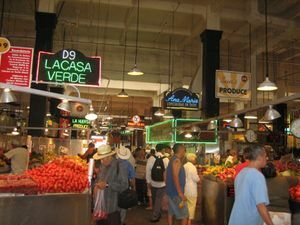 (317 S Broadway, Los Angeles, CA 90013) Although featured in the film only briefly, the Grand Central Market is a key to understanding Los Angeles. Since 1917, this hodgepodge of flavors has been gracing the Los Angeles community with wonderful eats, treats, and a wonderful sense of eclectic community.The site brings together a range of Latin American and Asian cultures into a hub of cuisine unlike any other. 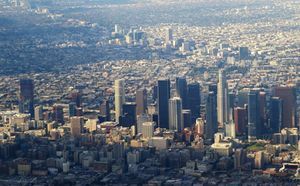 L.A. has been called “the least European city in America,” and this market is the embodiment of why. It isn’t really somewhere you can get out and dance (even if traffic is bumper-to-bumper), but this elevated intertwinement of freeways is the setting for the movie’s big opening number. 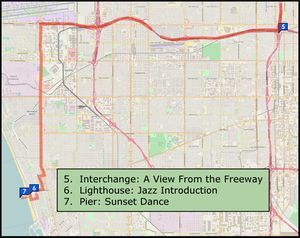 The interchange is only a brief drive-over, but it’s on the way to the film’s primary setting and offers a spectacular view of Downtown. After a long day of driving, make sure this is your sunset-viewing location. This is the place Sebastian dances after his and Mia’s first outing to The Lighthouse. Much more peaceful than the more famous pier of Santa Monica, visitors routinely gather at twilight to watch the sun dip below the horizon. On a clear day, the pier’s geography lets you see from Malibu to Long Beach. When you’re done viewing the gorgeous sunset, enjoy dinner at one of the many restaurants on the beachfront. 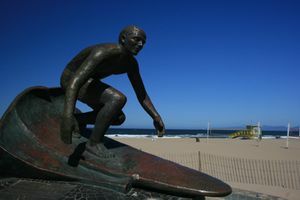 From a French bakery to Brazilian barbeque, Hermosa has an interesting blend of fun and upscale cuisine for all tastes. As with all tours with a mix of public and private property please be respectful. Just because they filmed inside does not mean that it will look like it does in the film. Major earthquakes are rare and most likely will not effect your travels. In the event of such an event, get to an open area, if you are already outside. Look out for falling structures and powerlines overhead. If you are inside, cover your head and brace under a sturdy object and follow the building's evacuation procedure. L.A. is notorious for its traffic. Follow rules of the road and practice defensive driving. Avoid confrontations with any other drivers. Like any major city, there are good and bad areas. Be aware of your surroundings. Police are there to help you, but you can help them (and yourself) also by using one simple rule: use your common sense (as one would do in any other sizable city). Being alone and utterly drunk is not the the best state to be in when walking through a deserted alley on a regular busy Saturday night, and during massive crowd-drawers like Pride or L.A. County Fair, one should be more careful than on an average Wednesday afternoon. Last but not least: looking for drugs or illegal activities will not only expose you to danger; if someone you just met is trying to lure you into a strange part of town for something decadent, assume you're probably being set up for a robbery or worse. This page was last edited on 28 November 2018, at 10:05.